If you’re anything like me, you love adding new decorations that correlate with the holidays and seasons. From buying new place mats to getting a new sofa, I love redecorating—especially for fall. If you want to change the style of your house for the fall, you don’t have to worry about always spending a big chunk of your paycheck on a whole house-worth of new furniture. In fact, there are a lot ways to have simple pieces or elements make a big impact on your living space and change the entire feel of your room! Whether you’re changing something as small as a pillow or as big as your wall color, you need to make sure you stay within the right color scheme. Popular colors for fall right now are warm colors like Benjamin Moore’s Pumpkin Spice (126), Audubon Russet (HC-51), or Thicket (AF-405). Swapping pillows is a small expense that can have a big impact on your overall room design. When picking the pillows for the season, keep your desired color scheme in mind. This neutral Surya pillow would really compliment any of the colors above! Having certain textures can also change not only the way a room looks, but also the way a room feels. Thicker fabrics, like velvets and burlap, will give your space a warm and cozy autumn feel. This Surya pillow is my favorite because it gives the illusion of burlap material, but it's much more comfy to lay on. If you’re going for that classic fall look where everything resembles the changing leaves, try hanging artwork that incorporates those colors. This piece of art, created locally by the Boyd's Mixed Media Art, is perfect to hang up throughout summer and fall—that way you won't have to worry about changing your pieces on the walls for at least a few seasons. If you're worried about your spending limit when it comes to redecorating for fall, consider investing in some focal pieces that will look great throughout the entire year. Take this Ashley Furniture sofa, for example. Its leather upholsterey will be super cozy to drink hot chocolate on throughout fall and winter, but it also won't look out of place during the warmer months. 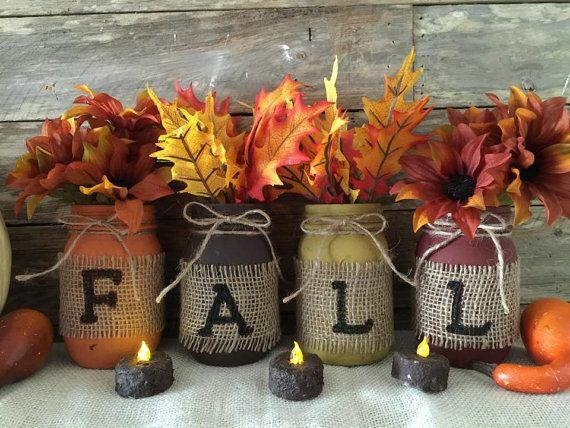 So what inspires your fall décor? Is it the leaves changing? Hot cider, hay bales, and corn stalks? If you bring these elements and colors into your home, it creates an easy way to add festive elements that won't always break the bank. Fall in love with your autumn home the same way as you fall in love with the season itself. Now, let the decorating begin!